Unique Fort Myers Party Boat Lagerhead Cycleboats Announces Exciting November 16th Launch. For the Fort Myers crowd, or those visiting the beautiful area, there's a fresh new way to have an amazing time. 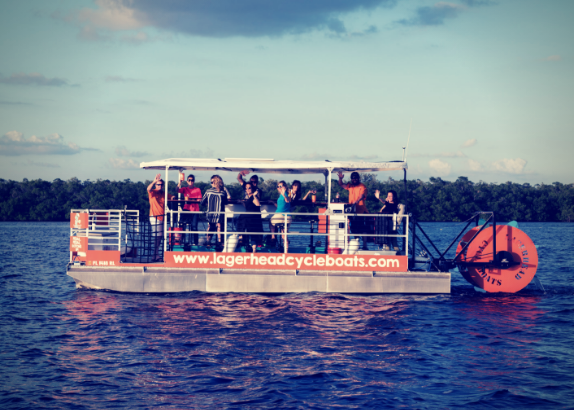 From fun, music, drink, quality time spent with friends and family, and even pedaling are all part of the new Lagerhead Cycleboats experience..
A whole new kind of fun-in-the-sun and on the water is soon to be available in Fort Myers, Florida. Lagerhead Cycleboats will start hosting BYOB parties on November 16h and pre- orders are available now. For the Fort Myers crowd, or those visiting the beautiful area, there’s a fresh new way to have an amazing time. From fun, music, drink, quality time spent with friends and family, and even pedaling are all part of the new Lagerhead Cycleboats experience. The adventure is set to begin on November 16th, 2018, but the company is accepting reservations now. Each trip comes with music, ice, water, and excitement; with guests bringing their own food and other drinks. Up to 16 people can come aboard. The enthusiasm surrounding the launch is high and rising. According to the company, each cruise lasts between two and three hours and ten pedaling stations are provided. There’s also a gas engine should guests want to take a break from pedaling to get a bit of rest or party more. Lagerhead Cycleboats is an excellent choice for tourists, locals who want a uniquely good time, bachelor or bachelorette parties, or corporate team building events to name just a few ideas. The team invites calls to discuss Fort Myers peddle boat party possibilities should anyone have any questions about what they offer. The experience includes a special Fort Myers dockside beach bar to make sure the fun is maximized. Early feedback on trial runs has been extremely positive across the board. For more information be sure to visit https://www.lagerheadcycleboats.com.